Bob was the kid in the back of the classroom drawing pictures of the English teacher. Like most artist, he is very visual and has always looked for the abstract designs in everything from cloud formation to reflections of light in water. “When I started college, I set out to get a major in art but realized the world is full of people with more artistic talent, so I got a second major in business. “ It is somewhat ironic that after a thirty year career as an investment banker, (which was preceded by a tour in Washington DC as Special Assistant to Senator John L McClellan), that Bob returned to his love of art as his lifetime passion. He started out in a water media class at the Arkansas Arts Center and had early success in annual exhibitions with Mid Southern Watercolorist. “Being able to take at least two workshops a year MSW taught by world class artist jump started my career”. It was during a workshop with Barry Thomas someone asked me if I had ever tried oils. “So the next day she provided me oils, brushed and a pallet and I approached the scene on the Arkansas River just like a watercolor and the painting sold the next week for double the price of my watercolors”. Today Bob paints in both watercolor and oils and continues to teach workshops in both media. In the past few years, Bob has taken and taught painting workshops in Italy, France and in various locals in the United States. 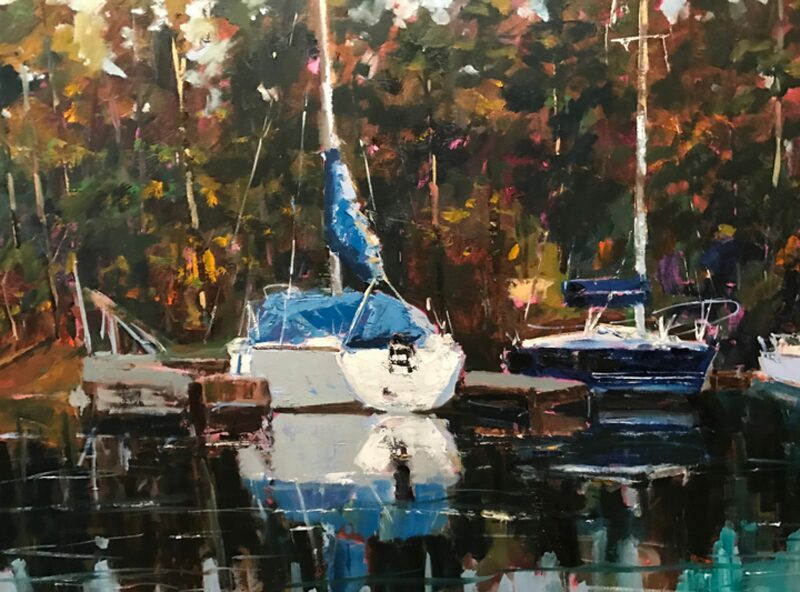 Being a daily painter, Bob has a sizable inventory of paintings which are sold in local galleries as well as in Colorado, California, Georgia and Florida. And he donates art to many charities such as the Arkansas Arts Center, The American Heart Association, Carti and Children’s Hospital of Arkansas. “It just seems to work out that when I donate a painting another one sells to a collector”. With the support of his wife Martha (insert picture), Bob is happy living the life of an artist in a world full of captivating subjects waiting to be painted. Bob is a graduate of Ouachita Baptist University and received an MBA from the University of Arkansas. Following two years as an officer in the US Army, Bob worked in the U S Senate and then had a thirty year career as an investment Banker with Morgan Keegan in Little Rock. Snider Studio & Gallery is located in Roland, Arkansas and is open by appointment and in two private art sales each year.